Barbecue is one of North Carolina's most popular foods as well as a beloved cultural icon. The word is thought to have entered the English language through the Spanish, who encountered in the West Indies the Taino (Arawakan) word "barbacoa," for a method of drying meat over a fire on a frame of wooden sticks. By the late 1600s, at about the time settlers introduced swine to the northeastern Albemarle area of North Carolina, English speakers began using the word "barbecue" to denote the wooden grill used widely by Indians and depicted by Jacques Le Moyne and John White in drawings in the previous century. North Carolinians probably had discovered the usefulness of this apparatus for cooking pork by 1728, when William Byrd wrote, "The only business here is raising of Hogs, which is manag'd with the least Trouble, and affords the Diet they are most fond of." In North Carolina, the unmodified noun "barbecue" has come to mean not just the grill or the method of cooking but also the pork cooked. Grudging agreement on usage, however, has not prevented North Carolinians from engaging in generations-long arguments about which style of barbecue can truly be considered worthy of the state. 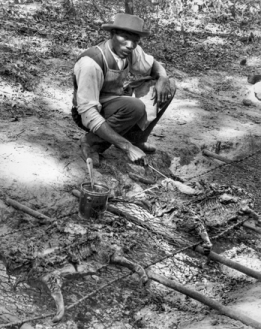 North Carolinians in the Coastal Plain generally understand barbecue to refer to its simplest and eldest form: a split hog roasted over a pit of coals, basted with a mixture of cider vinegar, red pepper, and salt, and then boned, chopped, or shredded and seasoned further with the basting sauce. The modern-day "pig pickin'" is representative of this barbecue style. Few commercial barbecue pits today are dug in the ground, and mass-produced pepper sauces are often applied after cooking, but a whole hog sopped with locally made vinegar-pepper formulas remains the recipe of choice for most pig pickin' devotees. In some areas, bits of skin are considered inte gral to the finished product. In the southeastern quadrant of the state, as in eastern South Carolina, Worcestershire sauce, sweeteners, and other ingredients are often added to the basic vinegar and pepper mixture. Baked corn sticks, fried hush puppies, Brunswick stew, and white or yellow coleslaw (often added to barbecue sandwiches) are common side dishes. Lexington, home to a popular barbecue festival, is the inspirational center of the western-style barbecue of the Piedmont and Mountains, where chopped or sliced pork shoulders or butts with a thin, tomato-based sauce are favored. Economy, fastidiousness, and health regulations prevent many vendors from basting with this more-combustible sauce, but it is served at table; hence its popular name, "dip." Hush puppies and red coleslaw ("barbecue slaw"), colored with ketchup or dip, are common accompaniments. On the fringes of its range, Lexington-style barbecue merges with the red barbecues of adjacent states. A third style of barbecue, pork with mustard-based sauce, has crossed the South Carolina line and found admirers farther north. Some North Carolinians also follow their southern neighbors in segregating skin, the dry "outside meat," and the juicier "inside meat." The fourth variety of barbecue common in North Carolina and confined to no area in particular is a composite of midwestern and other regional specialties: practically any meat chunked, chopped, or sliced, covered in one of a multitude of thick homemade or store-bought tomato-based barbecue sauces, and grilled over an open flame. Even the most open-minded partisans of this style seldom use the term barbecue alone for chicken or ribs, which are usually prepared with the same sauces. 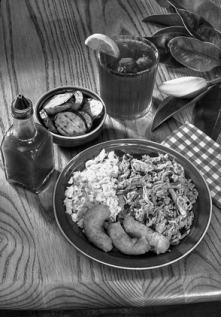 By the early twenty-first century, native and immigrant varieties of barbecue had merged, evolved, and traveled widely within and without North Carolina. All contained generous amounts of salt, cholesterol, tars, and saturated fats, substances known or suspected to be harmful. Nevertheless, North Carolina barbecue has kept its several identities through change, neglect, and rediscovery, and its following has continued to grow despite occasional health fads and alarms. Marion Brown, Marion Brown's Southern Cookbook (1968). Lolis Eric Elie, Smokestack Lightning: Adventures in the Heart of Barbecue Country (1996). Bob Garner, Bob Garner's Guide to North Carolina Barbecue (2002). Ernest Matthew Mickler, White Trash Cooking (1986). Manuel Roig-Franzia, "On N.C. Barbecue, East and West Don't Meet-Except to Argue," Washington Post, 23 May 2005. Heck yeah man! BBQ ftw! Heck yeah man! BBQ ftw! Living an hour from Lexington has it's tasty benefits!